Up to 56 Million American Adults experience Chronic Pain from diverse conditions - Lower back pain, arthritis, diabetic neuropathy, Migraine Headaches, etc. Chronic pain interferes with different aspects of life - personal, social and work related, overall affecting quality of life. There are two basic forms of physical pain: acute and chronic. Acute pain, for the most part, results from disease, inflammation, or injury to tissues. It is a normal response to injury and is usually immediate and of short duration. Chronic pain is a condition that persists for more than 3 months, and long beyond the time of normal healing process. It ranges from mild to severe and can last months, years or a lifetime. Chronic pain is a difficult and at the best a frustrating condition affecting the life quality of many people. Its cause is not always evident, in which case we perform the necessary diagnostic tests to identify. LBP is the single leading casue of disability worldwide according to the Global Burden of Disease 2010. Up to 85% of Americans suffer from LBP during their life time. LBP costs about $ 50 billion / year to US Economy. The leading casuse of workers compensation injury. The leading cause of disability for people under the age of 45. The second-leading surgical procedure, and it's only getting worse. About 6.5 Million Americans are in bed / day from LBP. 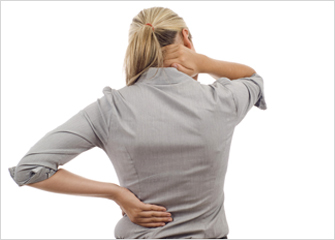 An Estimated 93% Million Workdays are lost / year due to LBP. While 90% of LBP resolves in 12 weeks, about 5 - 10% become chronic. An estimated $45-54 billion is spent on the treatment of LBP/ Year. While medical expertise exists to treat many painful conditions, most goes untreated or improperly treated. If you are a person with serious chronic pain, it is highly likely that you have been going from one healthcare provider to another seeking pain relief. And it is likely that you have been told, "nothing more can be done" or "you'll just have to live with it". At our Interventional Pain Management Center, we will exercise all our expertise to identify the source of pain and make sure you better understand your pain and provide effective medical and interventional options to help you find pain relief. American Academy of Pain ManagementThe American Academy of Pain Management (the Academy) is a non-profit organization that educates clinicians about pain and its management through an integrative interdisciplinary approach. . .
American Medical AssociationHelping doctors. help patients. Get the support you need to practice medicine effectively—in every stage of your career. American Society of AnesthesiologistsFounded in 1905, the American Society of Anesthesiologists is an educational, research and scientific association with 43,000 members organized to raise and maintain the standards of the medical practice of anesthesiology and improve the care of the patient. International Spinal Injection SocietyThe International Spine Intervention Society is an association of physicians interested in the development, implementation and standardization of percutaneous techniques for the precision diagnosis of spinal pain. . .
American Society of Interventional Pain PhysiciansThe American Society of Interventional Pain Physicians is a not-for-profit organization representing interventional pain physicians across the country. The organization has been growing rapidly since 1998 and has had a substantial impact on the practice of interventional pain medicine. North American Spine SocietyNASS is a multidisciplinary medical organization dedicated to fostering the highest quality, evidence-based, and ethical spine care by promoting education, research, and advocacy. Spine UniverseResource for back pain and neck pain, information on treatments, conditions, back pain exercises, surgery, prevention and recovery.